What could be more welcoming than a roomful of smiling faces gathered around freshly-baked bread and delicious-looking sandwiches? 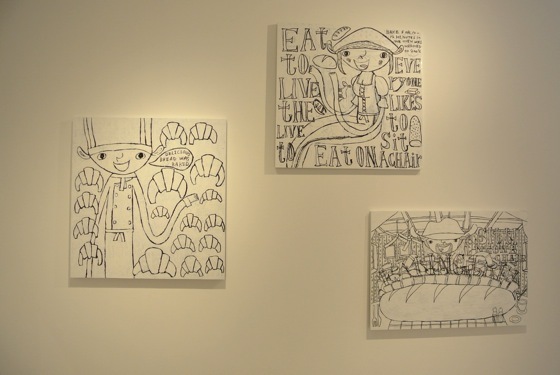 Perhaps an art gallery in Tokyo on a cold winter day displaying drawings of various bread and people eating them. 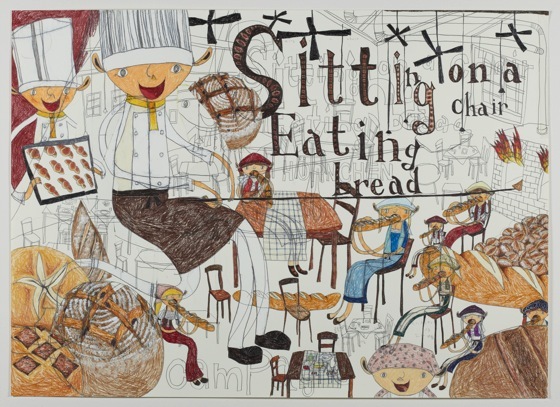 Tokyo artist Shintaro Miyake’s exhibition “Sitting on a Chair, Eating Bread” at 8/ ART GALLERY/ Tomio Koyama Gallery offered such winter respite. 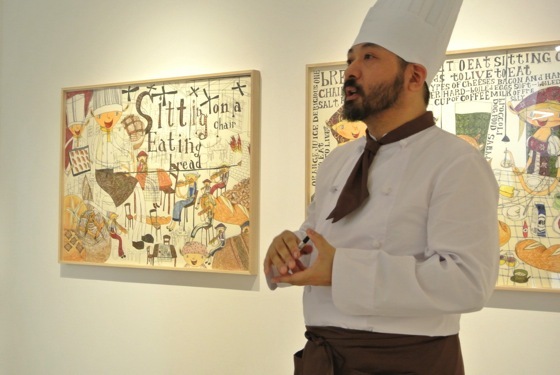 Sintaro Miyake in front of his drawings. 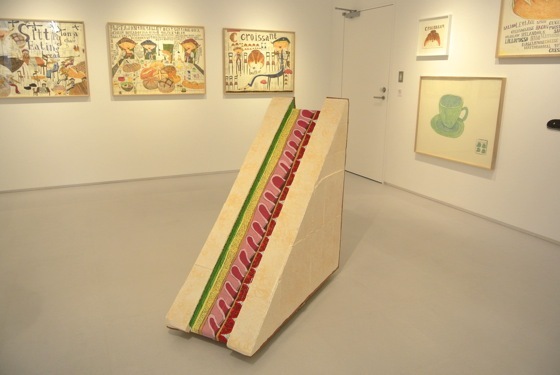 Exhibition view of “Sitting on a Chair, Eating Bread” at 8/ ART GALLERY Tomio Koyama Gallery, Shibuya Hikarie. 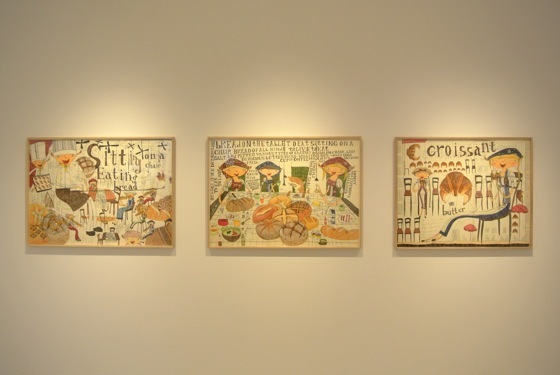 Standing in the middle of 8/ ART GALLERY/ Tomio Koyama Gallery, which showcased a giant cardboard sandwich and drawings of people baking and eating a bread, one would not guess that “death” was the inspiration behind this exhibition. At an artist talk held at the gallery on December 18th, 2013, Miyake explained (sounding not unlike Woody Allen) that he had feared death – or more specifically, his own existence disappearing after death – since he was a child. It was his existential fear, along with other personal experiences, that inspired the drawings at this exhibition. 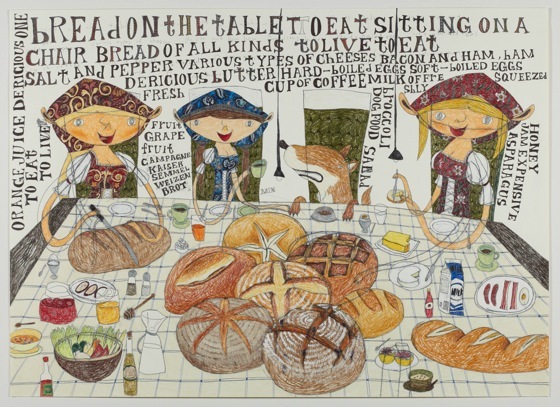 He first pondered on the act of eating bread when he was in the depths of an artist’s slump. One day, he ate a piece of bread in his studio, which was unusual for him; he usually favors other snacks, such as onigiri (rice balls). While eating this piece of bread and thinking about how life is full of misery, he realized that people eat even when things are really bad. He had also recently witnessed his own mother being nurtured through an IV when she was no longer able to feed herself a couple of years ago. 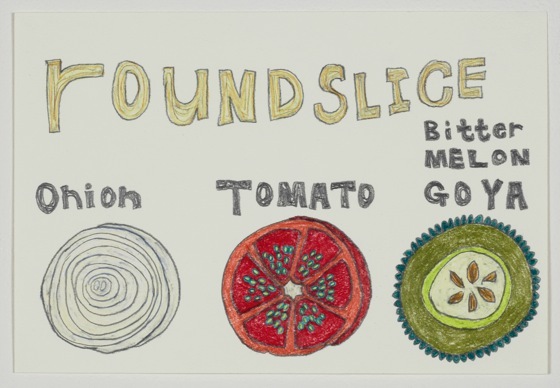 This impressed Miyake and made him think about the connection between eating and living. It may seem obvious, but people eat as long as they are living; it’s when people stop eating that they’ve given up on living. These thoughts led him to the title of this exhibition, which the artist admits is perhaps too long and literal. 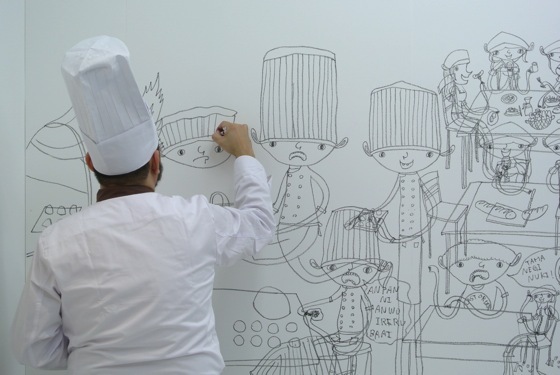 Whatever the exhibition theme, Miyake’s drawings are always cute, featuring his trademark character, “Sweet-san (Miss Sweet),” who also appeared in his live drawing creation for this exhibition (images below). He has explained that drawing cute subjects comes easy to him because he understands cuteness. Along with the cute characters that appear in his drawings, such as “Sweet-san (Miss Sweet)”, a trademark character from his earlier works, he is also known for dressing up for performances according to the theme of his exhibition. 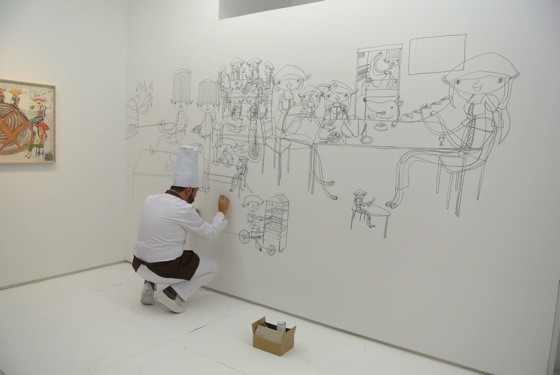 Shintaro Miyake’s live drawing performance, in costume. 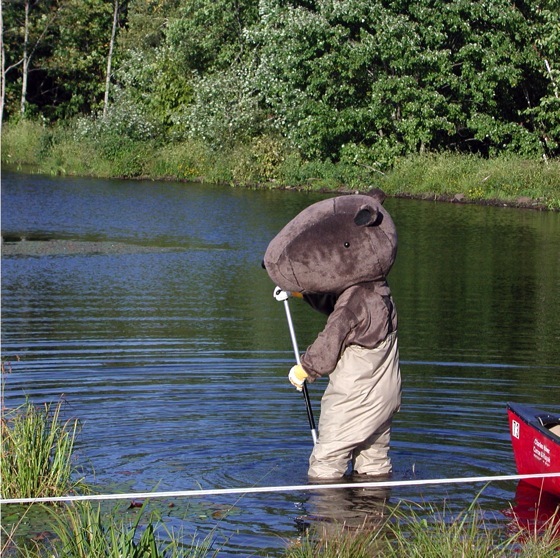 Miyake’s film “A Beaver’s Life” (2006) is a mockumentary that follows the artist in a beaver costume, building a home on a lake in Barre, Massachusetts. The film is a record of the artist’s project in Massachusetts – creating a “beaver’s dam” in an actual lake. 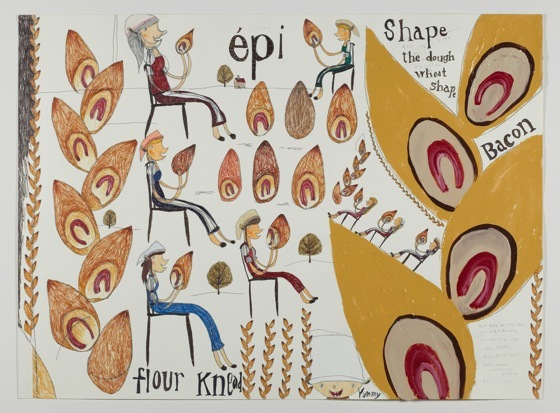 There was also an accompanying exhibition held at the Massachusetts College of Art and Design. When he decided to hold a show in Boston, he had been wanting to do something aquatic. He found out that there were beavers living in Massachusetts, and ran with the idea. 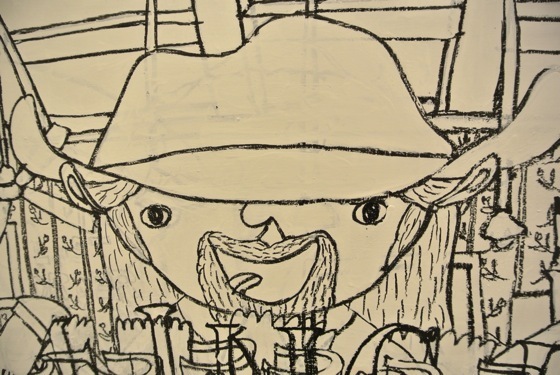 As he dressed up for his beaver project, Miyake often dresses up for his live drawing performances. He considers the setting of the exhibition and tries to offer a performance that meets the public’s image and expectation regarding the exhibition’s theme. This is perhaps similar to Tadanori Yokoo’s performance at the Hyogo Prefectural Museum of Art in 2010, in which the artist dressed up as a construction worker and physically entered the scene of one of his “Y-Junction” pieces while he performed a live painting in the museum. By becoming part of the scene that he was creating, Yokoo brought together the artist’s realm and the audience’s world to create what is essentially his art. 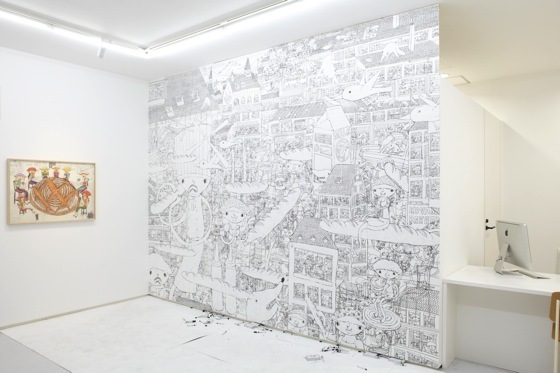 While Miyake’s performances are more fantastical and far from adding reality to his drawings, there is a similar sentiment in his actions in which he attempts to create a special space for his art and his audience. The overlaps of Miyake’s pencil lines revealing arms beneath tables, and chairs behind faces give the impression that the artist draws somewhat haphazardly. This may not be a fair assumption to make, but Miyake does have somewhat unorthodox ways of gathering inspiration and working out the composition of his work. 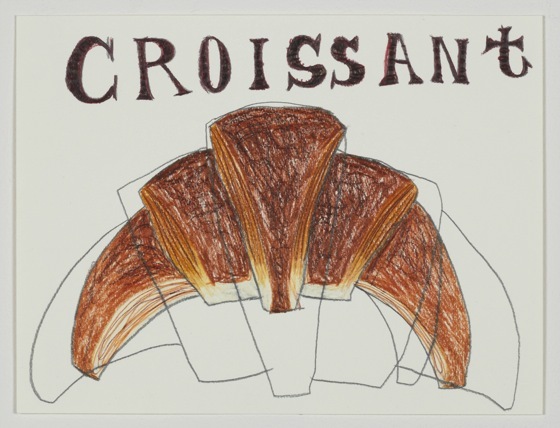 After he completed several bread drawings for this exhibition, he asked his Twitter followers what other kinds of bread he should draw. 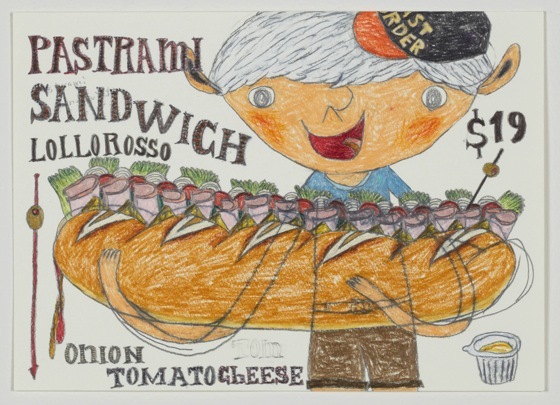 In response to his tweet, someone asked him to draw sandwiches. This idea appealed to Miyake. He looked up sandwich fillings, weights and prices, and created some seriously large sandwiches. 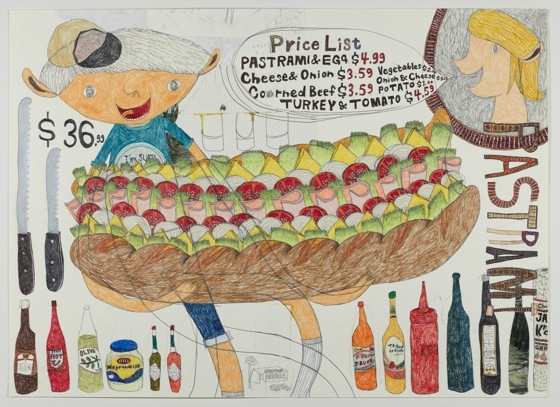 During his artist talk, he proudly shared that he became quite good at drawing onion slices in the process of drawing these sandwiches. Miyake also claims that drawing with a vision in mind produces a boring drawing that is too balanced and formulaic. He simply starts drawing, and stops when he thinks he has filled up the right amount of space, ignoring any rules of perspectives or ratios. The artist’s quixotic nature is apparent in the work “Happiness Might be Falling”. Miyake began with the idea of drawing a horizontal baguette. 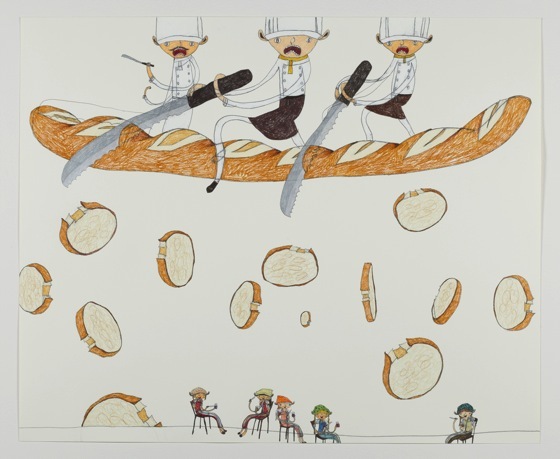 He then wanted to draw people on top of the baguette, but ran out of space while drawing the bread-riders’ hats. Next, he decided to have the three bakers on top of the bread also cutting the bread, with slices falling towards the bottom of the drawing. He then set out to fill the space below the baguette with people eating the falling slices. After creating five such bread-eaters, however, he decided they were enough. It was not exactly carefully planned, but the drawing ended up looking just right. While Miyake takes care to incorporate his own condition and geographical context into his work, there is no doubt that he has an imaginative approach to creating art, unfettered by reality and rules. Therefore, it was a little surprising to hear that there’s an actual model for one of his paintings in this exhibition. The man with the cowboy hat in “Diner” was modeled after professional poker player Chris Ferguson. Miyake hopes to use this painting to connect this series to his next series on playing cards and the game of poker. The artist revealed that, driven by his fear of death, he’s been working on drawings of hell as well. These drawings have not been unveiled, but apparently, his drawings of hell are still cute.